You have the right to use them in commercial (for profit) work, but not redistribute the original files, altered or not without permission; , except in the case of 3rd party copy right holders (as in Jabba the Hutt, Yoda, The Violator, Spawn, etc...) then they may be for personal use only. 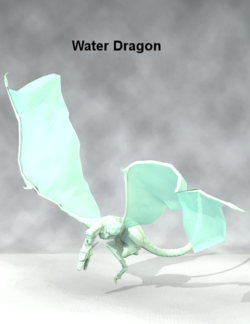 Water Dragon was modeled by Sixus1 Media. This page was last edited on 27 August 2018, at 00:05.